July's birthstone, the ruby, is known for its pristine color and value, which can be more than a diamond at the same size when a ruby is found with exquisite clarity. In most circumstances, maintaining your corundum, as the ruby is known as in the mineral world, can help avoid discoloration and damage. Rough rubies are actually easier to clean than rubies that are already in a setting as rubies are only second to durability to the diamond. Soak the rough ruby in lukewarm water. 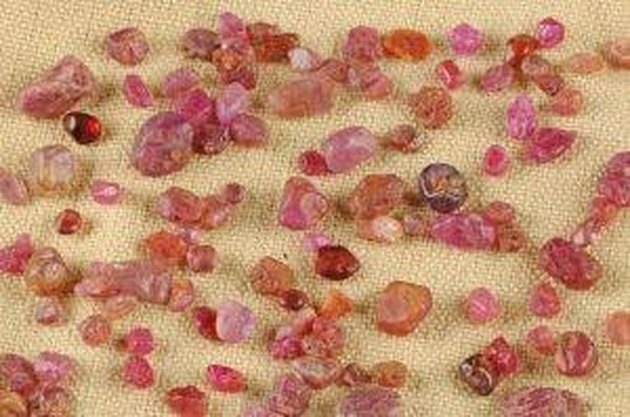 Place your rough ruby in a bowl of lukewarm water, which is a mix of about 3 quarters warm water and 1quarter cold water. This will help to break up some of the dirt and oils that may exist on your ruby. Allow the rough ruby to sit for about an hour. Remove the ruby from the soak. After you have allowed the ruby time to soak, remove it and gently rinse it off using warm flowing water. Ensure that if you are doing this over a sink and that it is plugged so the ruby does not accidentally go down the drain. Choose a nonabrasive cleaner. Now that you have removed the preliminary dirt and oils from the rough ruby it is time to wash it. Using either gentle dish soap or a commercial jewelry cleaner that is both nonabrasive and is specifically certified to clean rubies, prepare a soapy warm water mixture in the cleaned bowl used to soak the rough ruby. Cleaners that are not approved to use on rubies can discolor the gem or cause it to crack. Scrub the rough rubies using a soft bristled brush, sponge or towel. It is important to avoid damaging your rough ruby during the maintenance or cleaning process. That is why if you intend to clean your ruby using a brush, then it is recommended you use a soft bristled brush, such as a toothbrush. Refrain from scrubbing too vigorously, even with a soft bristled brush, to avoid surface scratches on the ruby. Rinse your rough ruby thoroughly. After you have cleaned your rough ruby, rinse it off using warm water once again to remove all of the impurities scrubbing has dislodged from the gem. When your ruby is thoroughly rinsed off, blot it dry using a soft cloth. Store your rough ruby in a cloth-lined storage area separate from other jewelry. Since rubies are very durable, they can actually damage other jewelry pieces they are near if they come into contact. Placing your rough rubies in a cloth-lined enclosure should protect the ruby as well as other jewelry from damage. After drying your ruby, avoid touching it with your bare hands as oils and acids from your hands can damage the ruby if allowed to sit and fester. Using ultraviolet cleaning methods should be a last resort when cleaning rubies as it can cause the piece to shatter if it is damaged in any way. You should also avoid wearing your ruby until after you have applied your makeup, lotions and hair spray to avoid chemical damage to the gem.